SudoCue is Freeware. That may set your expectations a little lower than usual. 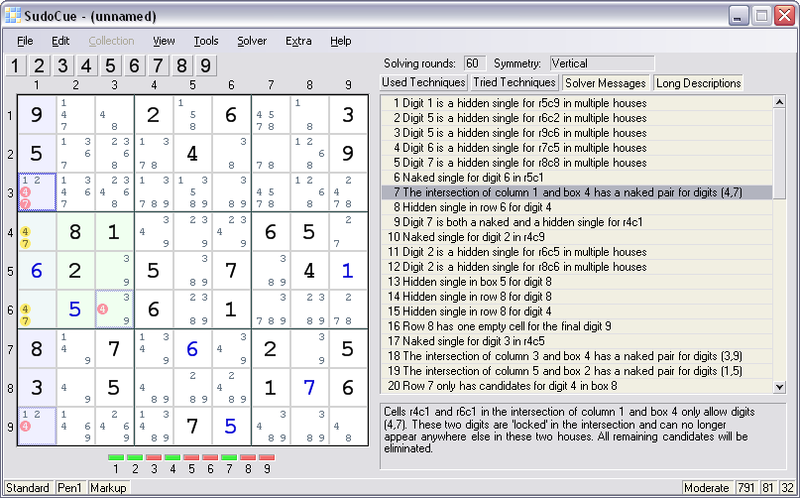 Nevertheless, SudoCue is one of the most powerful sudoku solvers currently available, and it has many features that you will fail to find in any other sudoku program. Key features in a sample screenshot. Here is a list of the most prominent program features. New ones are added as you are reading this. Join the user forum and you can help decide what will be added next. Coloring, Multi-Coloring. Color Trap, Wrap and Wing. Ultracoloring for individual candidates, unique feature! Smart hints from the log, current progress. Candidates and groups are highlighted to illustrate the hint. Sudoku scrambler makes a puzzle unrecognizable, but solvable in the same way, unique feature! Canonicalize Sudokus to detect scrambled equivalents. unique feature!